Movies about Mumbai are many. 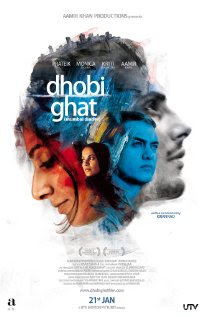 Mumbai Diaries (Dhobi Ghat), joins their ranks, not as a pretender but as a rightful contender in the list of intelligent and appealing movies from and about Mumbai. The movie follows four of Mumbai's citizens, each very different from the other, but all inevitably entwined together. The stories are heartfelt and human, thought provoking without being pedantic and in their own way eye-opening without being shocking. Shai (Monica Dogra) is an investment banker, currently on sabbatical from work and has a penchant for photography. Arun (Aamir Khan) is a modern painter, successful, loner and possessive of his independence. Yasmin (Kriti Malhotra) is a new bride in the city, having accompanied her husband from the north of the country. She is making a video of herself and the city for her brother, who has never been to Mumbai. Finally there is Munna (Prateik Babbar), a hardworking "dhobi" from the infamous city slums, who dreams the quintessential dream, to one day become an actor in Bollywood. The movie is a tale of relationships between the different characters. The most complicated is between Shai and Munna. Munna, a hardworking young man, is used to his place in the stratified socio-economic class system of modern Mumbai. Shai, with a predominantly western attitude towards social interactions, treats him very differently - first as a fellow human being, then as a true friend. This leaves a very confused Munna, seeking something more than friendship. Unbeknownst to him, his understanding of the nature of their relationship also holds the key to his personal redemption. The relationship between Arun and Shai is, in a certain way, more typical yet just as intriguing. Born of a late night filled with too much alcohol, it waxes and wanes, drifting between rejection and obsession. In a certain way their dance reminds one the relationship between the western world and India - pointedly indifferent and sometimes fascinated. Finally there is the particularly heart-wrenching journey of Yasmin, as seen by Arun through the un-mailed tapes he finds in his new apartment. The tapes start off with the happiness of a new bride in Mumbai, with its alluring lights and fascinating sights. And then as life settles in, and the realities start to take hold, the excitable child must grow up - no matter how big the cost. Dhobi Ghat reaches no conclusions. It is a brief window into the workings of a modern Indian city, sometimes confused, sometimes unfair but mostly business as usual.